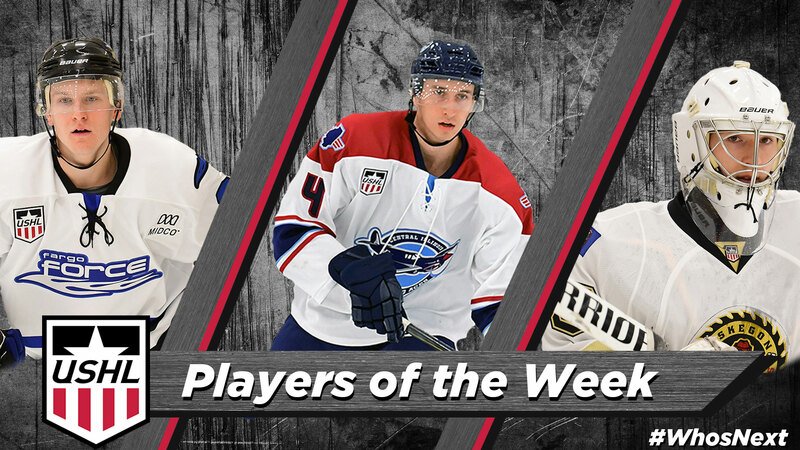 The United States Hockey League announced the Forward, Defenseman and Goaltender of the Week for Week 2 of the 2018-19 season. 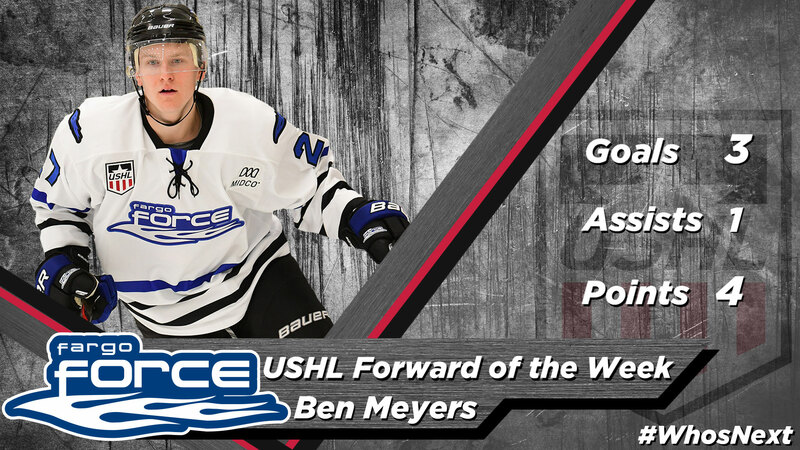 Fargo Force forward Ben Meyers, Central Illinois Flying Aces defenseman Sebastian Dirven and Muskegon Lumberjacks goaltender Brandon Bussi all earned their first weekly honors of the season. Meyers scored three goals and added an assist over the weekend in Fargo's split with the Sioux Falls Stampede. Dirven scored a goal on Friday and dished out an assist on Saturday to go along with a +1 rating. Bussi was outstanding between the pipes for the Lumberjacks, as he stopped 31 of 32 shots on Friday and recorded a 33-save shutout on Saturday as Muskegon completed a weekend road sweep of the Youngstown Phantoms. The USHL is America’s only Tier 1 junior hockey league, and continues to lead the world in the advancement of players to Division I college hockey. Meyers scored his first goal of the season on Friday in Fargo's home-opening win over the Sioux Falls Stampede before lighting the lamp two more times and dishing out an assist on Saturday. The University of Minnesota commit is off to a hot start this season, as he has started the year with a four-game point streak, recording seven points (3G, 4A) in that span. Those seven points have him tied for second in USHL scoring through the second week of the regular season. This is Meyers' second full season with the Force, as the Delano, MN native played in all 60 regular season games with Fargo last year, recording 44 points (24G, 20A) in those contests. He also put up seven points (4G, 3A) in 14 Clark Cup Playoffs games last season to help the Force to their first-ever Clark Cup. Prior to his time in the USHL, Meyers played four seasons with Delano High in Minnesota. He was selected by Fargo in the seventh round, 96th overall during the 2014 USHL Phase I Draft. Dirven found the back of the net for the first time this season and registered a +1 rating on Saturday against the Waterloo Black Hawks. He then added his second assist of the year as Central Illinois took down Green Bay 6-3 on Sunday afternoon. The Cornell commit has recorded a point in each game this season, tallying three points (1G, 2A) through his team's first three games of the year, leading all Flying Aces defenseman and tied for fourth among all USHL blueliners. 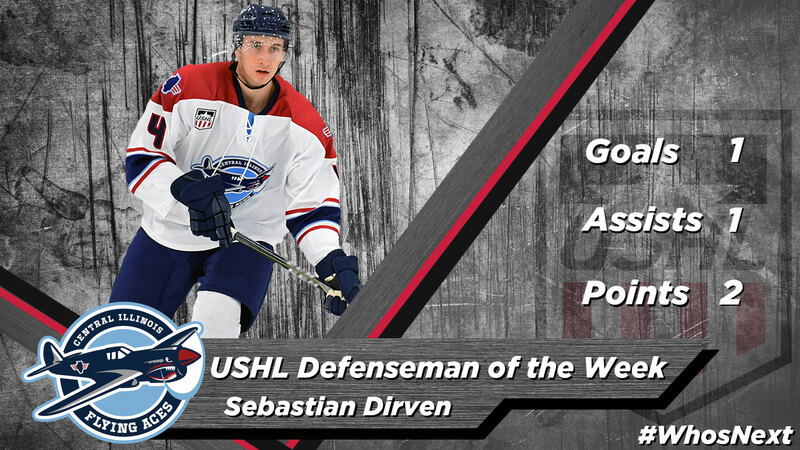 Dirven is in his second season with the Flying Aces, as he played in 56 games with the team last season, amassing 11 points (2G, 9A) in those contests. A native of Cornwall, ONT, Dirven suited up for the Cornwall Colts (CCHL), OHA Gold Mavericks (OEMHL) and Seaway Valley Rapids (OEMMHL) in Canada before coming to play in the nation's only Tier 1 junior hockey league. Bussi was nearly unbeatable between the pipes this weekend. He stopped 31 of the 32 shots he faced as Muskegon defeated Youngstown on Friday. He was even better on Saturday, turning all 33 attempts he faced aside to earn his first USHL shutout and lead the Lumberjacks to a weekend road sweep of the Phantoms. His 33-save whitewash was just the second shutout recorded among all USHL goaltenders so far this year. The Sound Beach, NY native is off to a hot start to the season, amassing a perfect 4-0 record to go along with a sparkling 1.72 GAA and .940 SV%. His 1.72 GAA places him sixth among all USHL goaltenders through two weeks of the season, while his .940 SV% is good for fifth among league netminders. 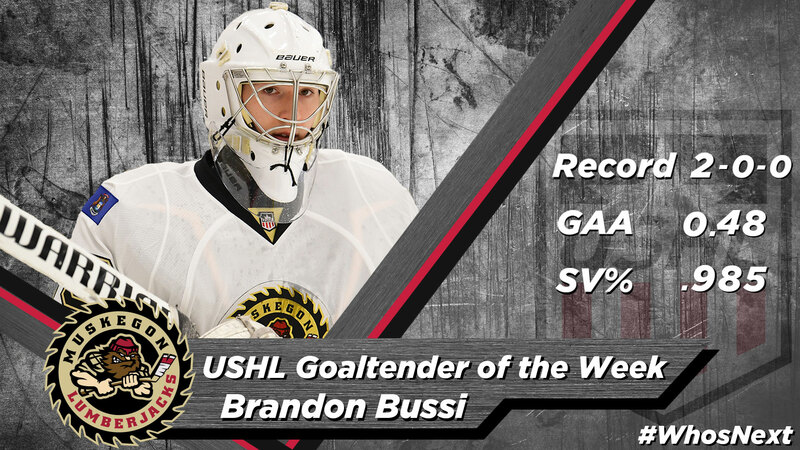 2018-19 marks Bussi's first season in the USHL, following two seasons where he backstopped the NAHL's Amarillo Bulls and New Jersey Junior Titans as well as the P.A.L. Junior Islanders. He is committed to St. Lawrence University.